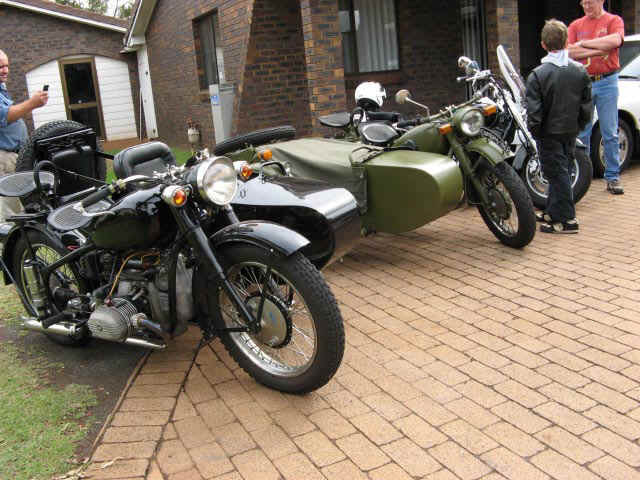 While I was a member of the Ballarat Rovers Motor Cycle Club in about 1966, I visited Alwyn Sobey's place and looked over his BMW and Stieb sidecar outfit. I had also been looking at a book about the history of BMW bikes. I clearly remember the conversation: "One day, I would like to own a side valve engined BMW like the pre-war R71." Sobe responded, "No, Phil; you wouldn't want a side-valve BM, they were far too slow and didn't develop enough power." Sobe was undoubtedly correct about them being under powered and slow, but somehow, that didn't stop me wanting one. 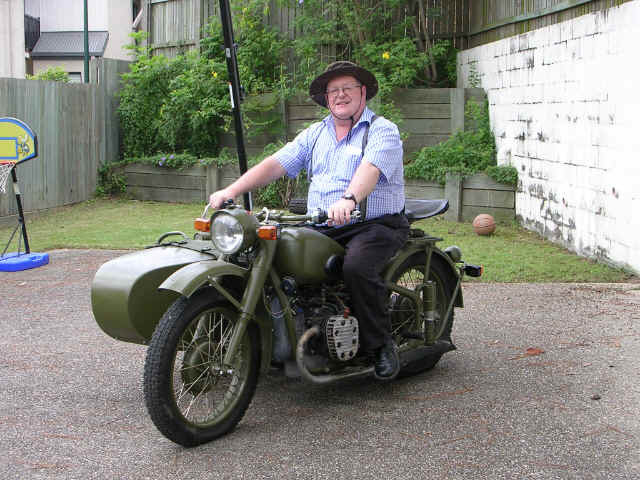 The years came and went and I owned sidecar after sidecar and every so often the thought would come back: "One day, I would like to own a side-valve BM outfit . . . ," but it remained a very distant pipe dream. August 1989: I see my first Chang Jiang outfits! The train wound its way through the New Territories of Hong Kong and crossed the river into Shen Zhen, in the People's Republic of China. The train stopped, but not at a station. I heard a sound outside that made me pull the curtains aside and look out. 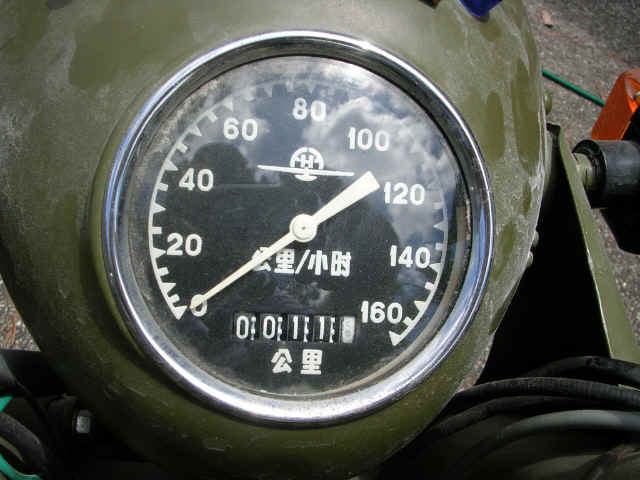 The train was surrounded by machine-gun toting PLA soldiers mounted on motorbikes with sidecars! What a sight! Suddenly I noticed something else. The bikes appeared to be side-valve BMWs! After a thorough search the train was permitted to continue with two armed soldiers guarding each carriage. In Guang Zhou, as we looked around at the various sites, we saw many more of these bikes being ridden by soldiers and police. 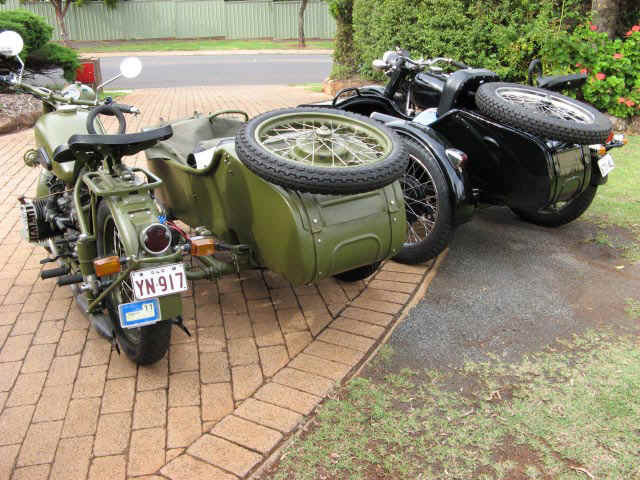 They had chinese markings, so were obviously not BMWs, but they were dead ringers for the 1938 BMW R71. I learned from a policeman that all of the bikes had 750cc engines. Perhaps, one of these days, I might be able to purchase one and take it back to Australia! January 2004: I start daily dreaming of my future bike. One evening in late 2003, Wendy and I were in Sai Kung, NT, when we heard a motorbike. 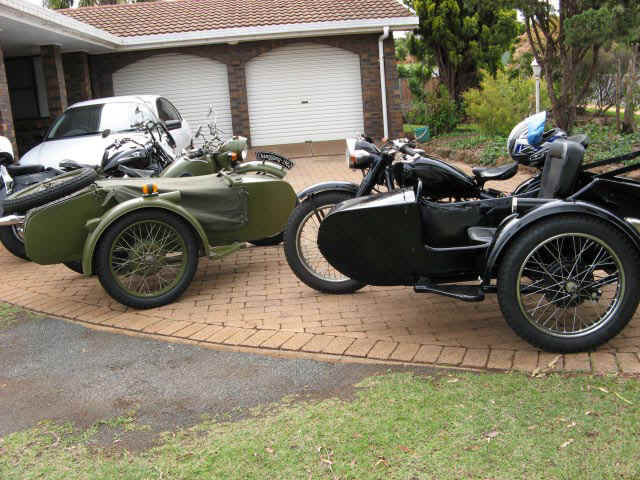 I watched as a black motorbike and sidecar sped past and I heard it continue around the block and pull up. I found it parked on the footpath outside a pub and immediately looked it carefully all over. Its owner, Simon Vallance came out and spoke to me. I have had the habit for many, many years of kneeling beside my bed every morning to pray. 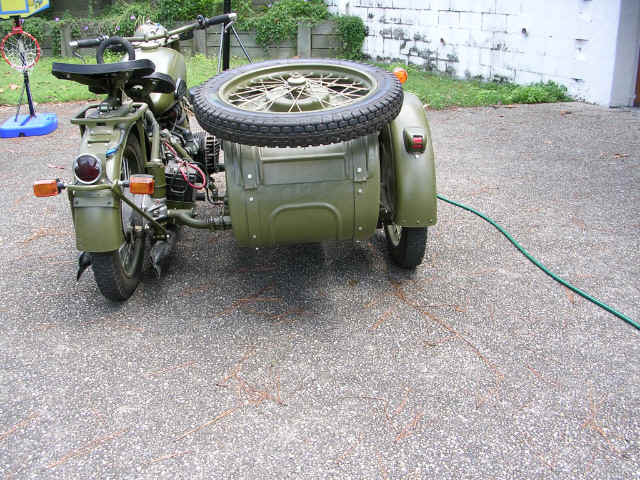 From January 2004, every morning when I knelt down, I would see images in my mind of myself riding one of those Chang Jiang sidecar outfits. As I was supposed to be praying and not daydreaming about motorbikes, I would try to "cast out those interrupting thoughts." Months went by and every day, without fail, as I knelt down the picture of the bike would come again. I went for counselling because I felt this was interrupting my prayer times. The counsellor said, "Have you ever considered that perhaps God might be asking you to buy one of those motorbikes?" I hadn't considered that and could hardly belive that God would want to bless me with one of the bikes that I had been occasionally day-dreaming about since 1966 - for thirty-eight years. I asked several other spiritual leaders about this interruption to my prayer times. All said "Buy the bike and your payer time will return to normal." 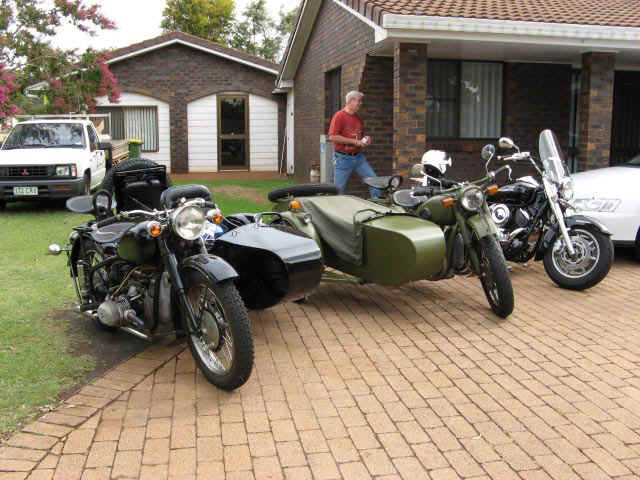 May 2004: The LHD Chang Jiang sidecar experience. 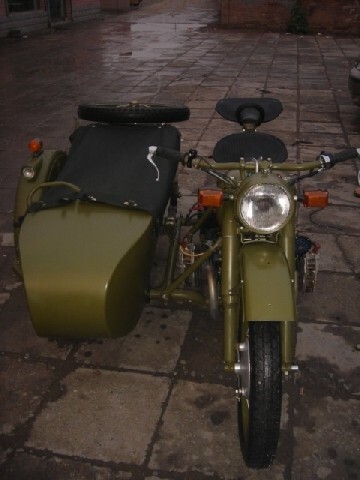 The picture at right is copied with permission from http://www.changjiangunlimited.com which is an excellent site for anyone interested in Chang Jiang motorcycles and sidecars. 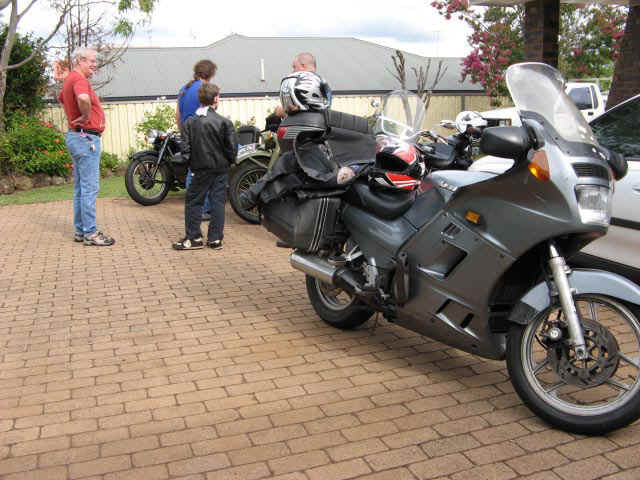 The black bike in the foreground is the one on which I took a test ride on Saturday 29th May 2004. 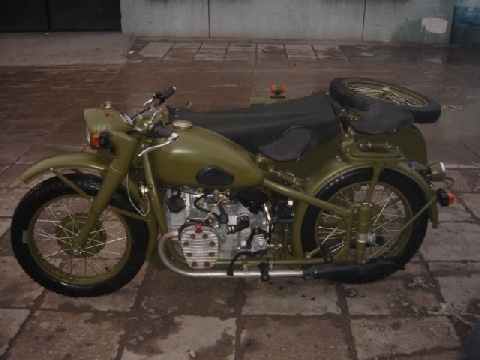 It is a Chang Jiang M1 750cc Side Valve Boxer-twin with 6V electrics which was restored by Gerald Gardebled at Long River Motorworks in Beijing and was brought to Hong Kong a couple of years ago. 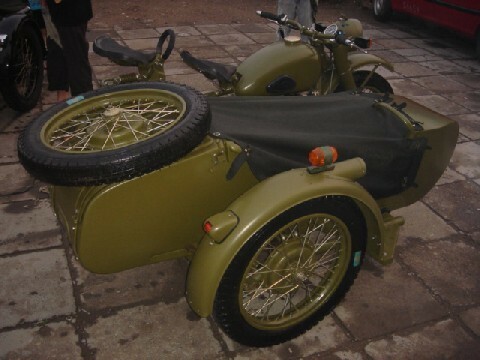 Chang Jiang sidecar outfits are still manufactured in China right up until the present day. 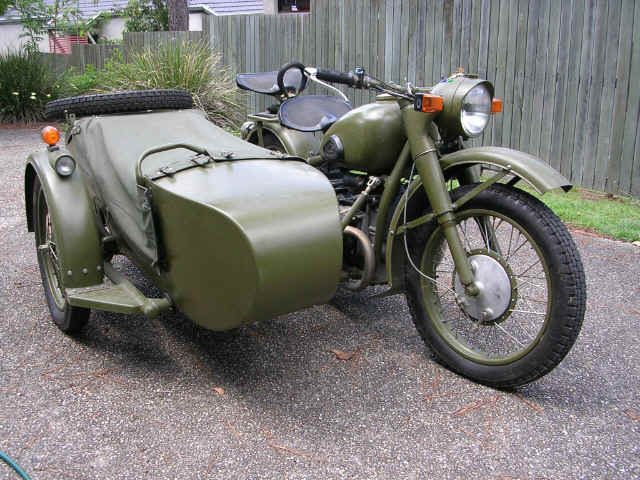 They were originally copied from the Russian Ural M72 which was itself copied from the 1938 German BMW R71. The green bike in the background is a 1960 Chang Jiang M1 750cc Side Valve Boxer-twin with 6V electrical system. It was found in a junk yard and restored by Simon Vallance. As I bounced over badly potholed and rutted tracks near Simon's place on the CJ750, my grin got so wide my ears nearly fell in! This rough track was exactly what the CJ was designed for. This was my first time on a motorbike of any sort since 1989! And I thoroughly enjoyed it. I just have to get one of these bikes! To subscribe to "The Chang Jiang Experience" and learn more about these bikes please use the above form. July 2004: Prophesies about the bike. In the Summer of 2004 I decided to earn some extra cash by teaching Summer School, so, after visiting my family in Brisbane for a couple of weeks, I flew to Hong Kong for the whole month of July, returning to Brisbane for another couple of weeks in August. During that month back in HK, our regular pastor Steve Durie was away on holidays and the four services were led by Jackie Pullinger and her team. During two of those services, I was called out to the front of the church where members of Jackie's team described in Chinese visions they believed the Lord had gave them concerning my life. These were translated into English for me. The first vision was "a bell, but not the whole of the bell, just the part that knocks against the side of the main bell to make it ring . . . does that mean anything to you?" It certainly did! At the time in 1966 when I had first gotten my desire to ride sidecars, my nickname had been "Clanger" or sometimes "Dinger", both of which were taken from my middle name "Bell". The nom be plume "Clanger" was used by me whenever I wrote for magazines or newspapers. The vision was pointing me back to the beginning of my motorcycling and sidecarring days. The second vision was described as being "like a washboard, the old-fashioned washboard that ladies used before there were washing machines, but this is very much larger than a normal one and it is made from white wood like the wood of the pine tree . . . does that mean anything to you?" It certainly did! At that same period in 1966, I had been a member of the BRMCC Stunt Team, and one of the props we used in our shows was an oversized washboard made from pine wood. The moment it was described in church, I could see it again in my mind's eye, all those years ago. 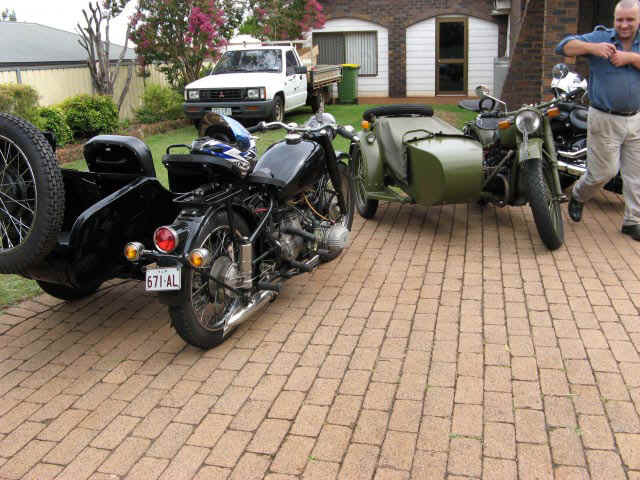 Both of the visions were pointing me back towards my days with the Ballarat Rovers MCC; the days when my motorcycling was really being cemented in me as a life long hobby as well as a means of transport; the days when I first began to desire a 750cc side-valve boxer-twin motorbike and sidecar. Neither of the young fellows that received the visions had ever met me before, and neither could have known anything about my growing desire to return to motorcycling. Back in Brisbane, I shared these visions with my wife Wendy and asked her to pray about them. She did so and responded that she felt I ought to buy one or two of those bikes. My own Chang Jiang is now ordered! 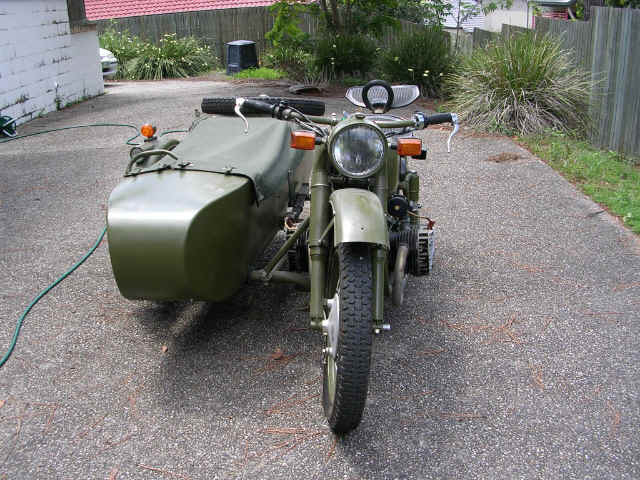 Today, Wednesday 3rd November 2004, I have confirmed my order for my own Chang Jiang 750 cc motorbike and sidecar. It will be a model M1M which is a side-valve with a 12-volt electrical system and a reverse gear. I have ordered it to be painted in flat Army Green. My Trip to Beijing - A Bike Named "Alpha" - How Cold can it get? On Saturday 22nd January 2005 I flew to Beijing to be met by Gerald Gardebled and Clay Jones on a motorbike named "Alpha". As the plane taxied towards the terminal the announcement was made that it was partly cloudy and the temperature was minus two degrees Celsius (that's 28 degrees Fahrenheit for the Americans). 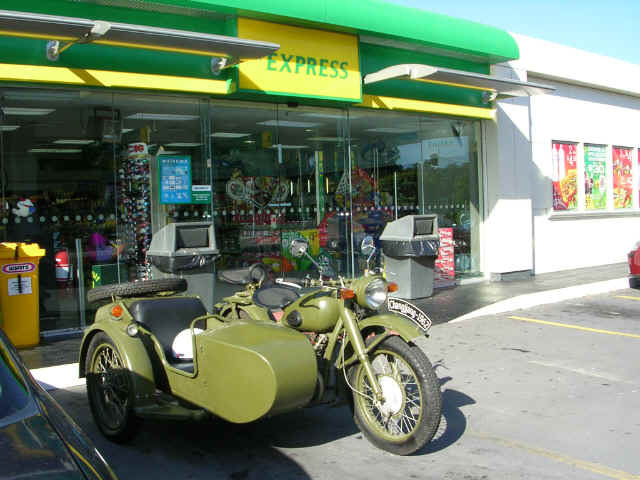 Out in the car park, Gerald pulled a huge warm fleecy-lined PLA great coat from Alpha's sidecar and handed it to me. 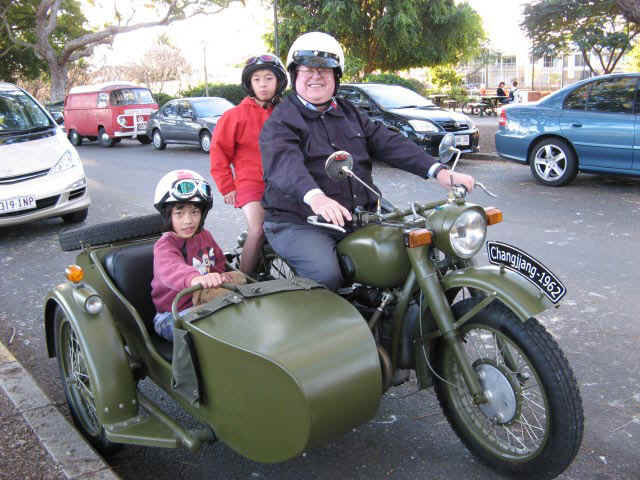 I thankfully donned it and climbed awkwardly into the sidecar - my first time sitting in a sidecar for more than twenty-five years! I was usually the pilot of these things, not the monkey! Alpha started on the first kick and we soon lined up at the Shroff Office to pay for the parking. Then it was out onto the Airport Expressway and Alpha soon settled into a comfortable 80 km/h or so cruising speed. The sound of that beautiful side-valve boxer twin motor was music to my ears. 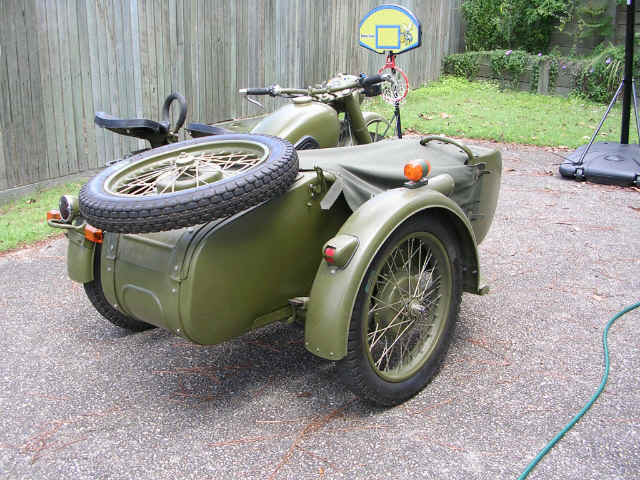 I was wearing a nice warm coat, and the sidecar tonneau cover was in front of me, but I had no hat or helmet. Now cool temperatures and high winds result in what meteorologists call a Wind Chill Factor. A quick little bit of mental arithmetic told me that the wind chill in that sidecar was about minus 13 degrees Celsius (or 9 degrees Fahrenheit)! I could have put my head down under the tonneau cover, but then I would miss seeing Beijing! According to the stamps in my passports, I have been to China seven times, but this was my first time to Beijing. So my head stayed out there in the wind. Presently my vision went a bit funny and I began feeling dizzy. I suddenly realised that the blood vessels leading to my brain were freezing and my brain was suffering from oxygen starvation. I therefore rode the rest of the way with my hands across my forehead to try to keep it warm. I looked up at Gerald in the driving seat: full-face helmet and good thick Dririder jacket .. he ought to be relatively warm; I looked up at Clay on the pillion seat: fleecy-lined leather hat and thick clothing ... he was probably warm too. But I wasn't about to complain to anyone ... I was enjoying being on a motorbike again! Presently we pulled off the freeway system and onto a network of local streets where it was easier for me to look out at our surroundings because of the lower speed. When Gerald stopped to call in at a shop, I took this picture with my digital camera which was behaving peculiarly. As my bike is the same colour as Alpha, this gives some idea of what a sidecar passenger's view of my bike will look like. When the time came to clamber out of the sidecar, I found that my balance was still very poor, probably due to partial brain freeze, and Clay had to help me out. I felt like a geriatric instead of a young 59-year-old! We made stops at a couple of Army Surplus stores where we looked at the incredibly cheap stuff that was available. I think that if I had not been still suffering somewhat from brain freeze, I might have bought a few items for myself. But at least I have some ideas of what is available and I can walk across the border near home any time and find an Army Surplus store in Shen Zhen. Soon we arrived at Long River Motorworks factory where I was introduced to my bike. I quickly got out my camera and managed a few shots before the batteries froze solid. Clay showed me all his Dong Hai parts and his beautiful Dong Hai outfit. Gerald showed me all the great parts he will be using to finish building my bike as well as a lot of very interesting vintage spare parts he has in stock. After an hour or two there, when it had become quite dark I decided to try for one more flash photograph of Gerald and Alpha. The camera utterly died after this rather weak flash, and I only found out by reading the manual after my return to Hong Kong that the camera cannot be operated at temperatures below 5ºC. All my camera problems were being caused by freezing batteries which promptly lost all their charge. Gerald, Clay and I went out to dinner at a Chinese restaurant where we continued talking bikes. Then, it was time to take a taxi and find my Hotel. Special "Thank You"s to Gerald and Clay for welcoming me and showing me around. Progress made on my bike: Gerald has sent me some more photographs of my bike that were taken the week after I was in Beijing. In the first photo at left, you can see the "Christmas Tree Effect" that is gained by attempting to satisfy the Australian Design Regulations (ADRs). The red light is the original CJ generator charging light. The Green light is the Neutral Gear light. The Blue light is the High Beam indicator light. The Yellow light is the Turning Signal indicator light. I probably could have gotten away without setting up this Christmas tree, as most vehicle inspectors probably would not look up the ADRs to see which year each requirement came in, but it would be just my luck to strike one who worked by the book. In the second photo, you can see the "roots" of my Christmas tree from inside the headlamp shell. 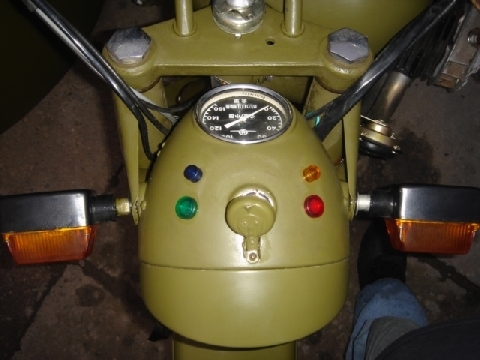 The turning signals were not mandatory for a motorbike manufactured in 1962, but if the signals are fitted, then they are required to have an indicator light as well. The high beam indicator is required, but I am not certain which year it came into the ADRs. I have also been unable to determine which year the Neutral Gear indicator requirement came in. The most useful one for a rider of course is the charging lamp which was already fitted to the CJ in its original state. The tail light on my CJ started life as a spare part to fit a Chinese PLA army truck. It is very similar indeed to the old "A" Model Ford tail lamp. While the CJ originally had no brake lights, I am having brake lamp switches fitted to both brakes in accordance with the ADRs and of course in the interests of my own safety. I am hoping in the future to come across a similar lamp to fit to the sidecar mudguard so that I will have a matched pair. 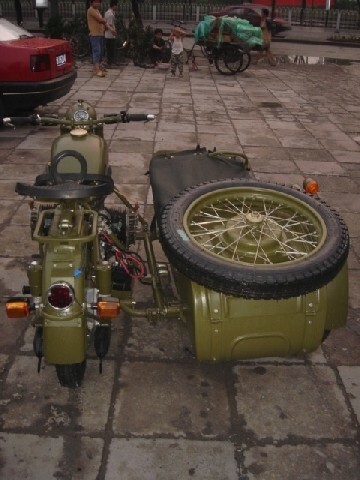 At present the sidecar mudguard will be fitted with the original vintage tail lamp. Also visible in this shot is the fabric-covered vintage wiring which will be used throughout most of the bike. One item I hope I never have to use is the handle below the rear tail light. I seem to recall so many Second World War films in which the Germans get their BMW outfits stuck deeply in the mud and they are then seen manhandling the machines out the morass by heaving on the handles over each mudguard. As my front mudguard doesn't have one of these, I guess I should plan not to get her into too much of a bog-hole! In the photo of the engine at left, youcan see that progress has been made in fitting throttle cables, air tubes, wiring, and valve adjustment covers since the photos which I took above. You can clearly see the rectifier below the voltage regulator which tells you immediately that this bike is fitted with an alternator and has a twelve-volt electrical system. Notice also the two gear selector levers on the left side of the gear box. The lower larger one is for selecting the four forward gears and neutral; the higher, smaller one is for selecting reverse gear - a very nice option to have on a sidecar machine. The photo of the engine taken from the right side shows that a great deal more plumbing and cabling has been completed since I was there. Of special interest is the hand gear change lever, a standard fitting on all CJs, which may become very useful due to the weakness I have in my left leg and foot due to motorcycle collisions many years ago. 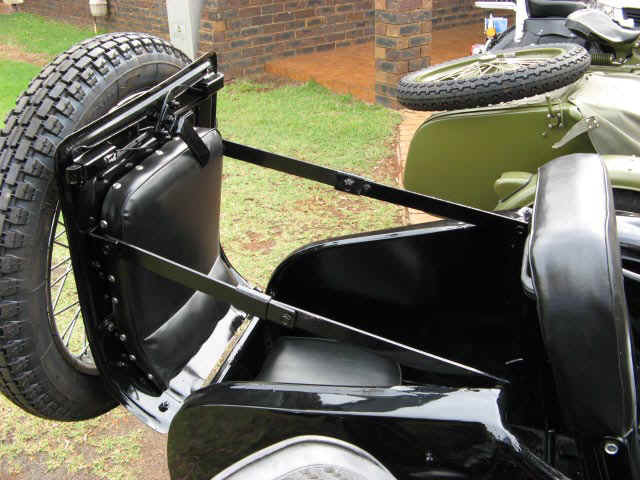 The upper sidecar mounts are also clearly shown here and at the left of the picture you can see the large battery case which will hold a very respectable car-sized battery to keep all of the electrical bits and pieces working happily. 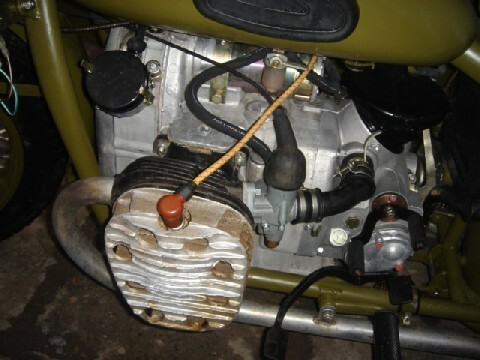 In the front corner view, you can see that the petrol tank and the two saddles have now been fitted. The black and blue item below the left front of the tank is the horn. If I follow my former habits, this will quite possibly be augmented with air horns at a later date. The spaghetti is still hanging out of the headlight. You can see the stainless steel header pipes which feed into the black fish-tail muffler. While I would have preferred a black header pipe, I am told that they don't last very long because of the intense heat produced by the exhaust gases. Also visible on the side of the tank, are the steel mountings for the vintage rubber knee pads. In the final shot of this set, you get a good overview of the now nearly complete outfit. On the top of the sidecar mudguard, sticking up like a sore thumb, you can see the right hand turning signal light which is made essential because of the fact that I shall be driving a left-hand-drive vehicle in a right-hand-drive country. Altogether it looks like Gerald is doing a really great job with this bike. While waiting for the paperwork for my bike, I decided to have a go at designing a tank badge based on the original BMW design. The result is posted at right. Just click the thumbnail for the larger view. I really need someone who is a graphic artist to clean it up a bit. It would also probably look better if the two Chinese words were not in an italic font. The two words of course are "Chang Jiang" in simplified Chinese. I had another go at this project on 11th April and came up with the badge with the black annulus. The thumbnail looks weird, but the full sized image is okay. For my third attempt I changed the Chinese characters to a white colour. I love this animated GIF of CJ riders having a ball. Does anyone know where this file originates? I would like to give full credit where credit is due and maybe write a little background about it. It's arrived! . . . My CJ was delivered to my home in McDowall Brisbane in September 2005 after spending a long time held up on the docks by some sort of a strike. In the photos at right (click on thumbnails for a bigger view) you can see my odometer showing 118 km which is how it came out of the crate. Gerald of LRM did over a hundred "shake-down" kilometres in Beijing at my request. 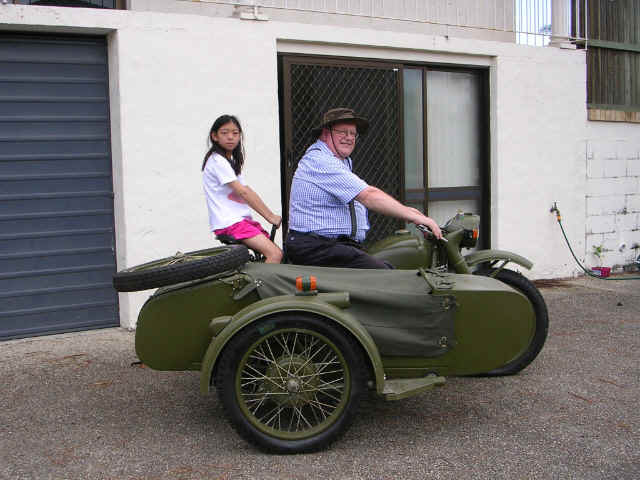 Then you see a couple of shots of me trying out the bike for size while my daughter Nina looks on. In the final photo, Nina jumps up on the pillion seat behind her Dad. 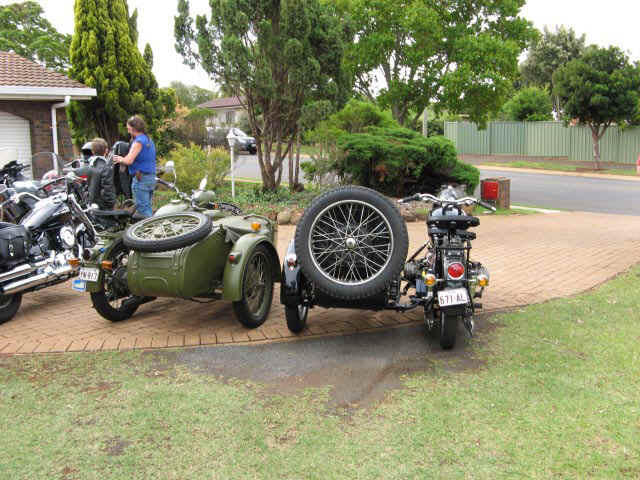 In this series of photos, you just get several different views of my bike parked in the back yard at McDowall. These shots were "as delivered" when the bike had been taken out of the crate, but no mirrors or anything else fitted. 14th November 2006: I registered the bike today, so I shall be riding it for several of my remaining five days in Brisbane. It turned heads wherever it went, and I think the whole staff of the Queensland Transport office suddenly felt the need to walk out to the inspection bay for a look. The jaws all nearly fell off the faces when I started her up and reversed out of the parking bay. I only did a handful of km, but it has already attracted a great deal of attention. Bikers and cagers alike all give the thumbs up, and I have had several police cars matching my speed in the adjacent lane so they could gawk at it ... and none of them even pulled me up for no number plate! One of them must have seen it at QT and put out the word that it was registered and where I was riding, because I have never seen so many police cars in a 4km drive in my life and they all gave me big smiles and cheery waves. I was wearing my illegal helmet too, but I don't think any of them were interested in it. The two pictures at right were taken at the BP station at Ferny Grove on the morning of 2nd January 2006. 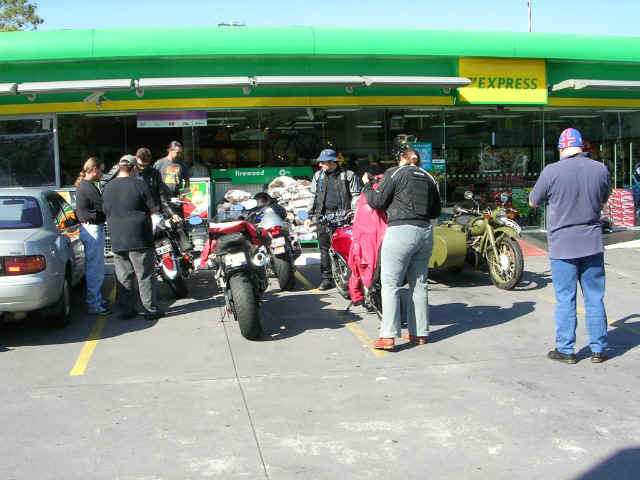 This was at the start of a ride organised by Brisbane Bikers. I did not go out with them on the ride, as I had to get ready to fly back to Hong Kong. New Farm ... to be inserted later. 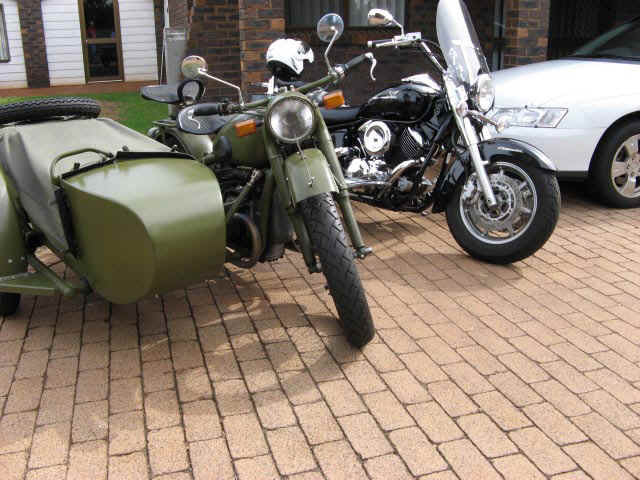 Yesterday, 28th December 2006, I took my Chang Jiang M1M on its longest run to date: from McDowall to Toowoomba and back, about 300 km (186 miles) and actually remembered to take a camera with me. I left home at around 09:30 and travelled via Metroute 5 to bypass Brisbane, then via Ipswich Motorway and then the Warrego Highway. Crossing the ranges near Marburg saw third gear necessary and the CJ pulled all the way up to the top of each at around 50 km/h. The Great Dividing Range at Toowoomba called for second gear all the way up and she cruised up at around 30 km/h easily able to pass all the trucks which were crawling up at a snail's pace. As always while out and about I had to explain about the CJ to plenty of curious onlookers. I arrived at Tony's place at about 12:45 having taken 3 hrs 15 mins to cover the 140 km. 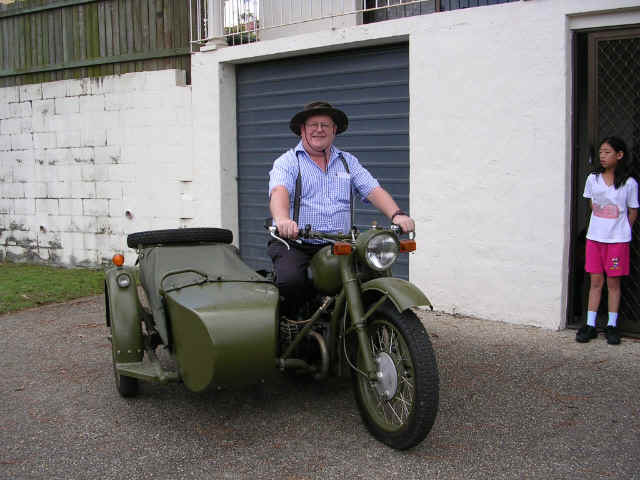 While at Toowoomba, I met Dale Warner, who has just taken delivery of a brand new M1S with a left hand two-seater sidecar. We also pulled Tony's bike out of the garage for some photos. Roscoe also arrived on his Kwaka. 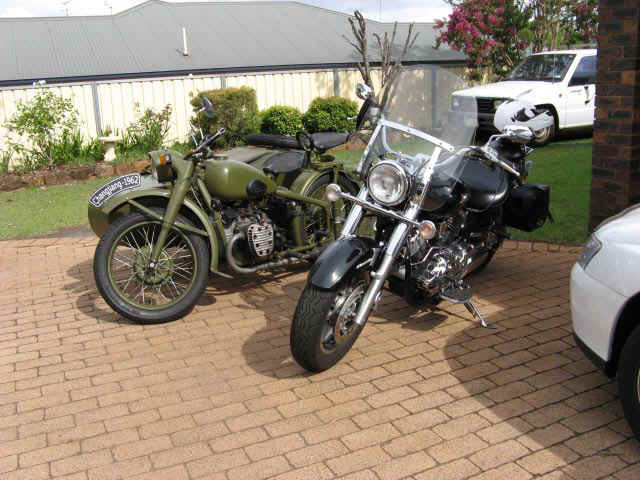 Cruisers old and new: Tony's new Yamaha cruiser beside my CJ. Another view of old and new. Old CJ meets new CJ: Dale arrives in Tony's driveway. Another view of the two CJs as Dale also takes a picture. The LH and RH CJs lined up side by side. 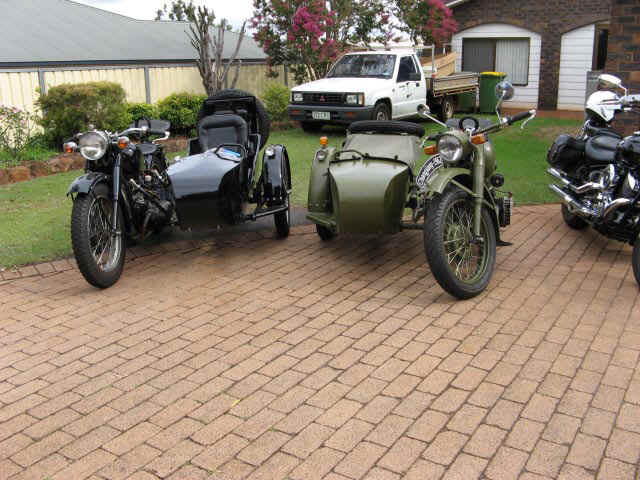 The black one is normal and legal in Australia, the green one can only be registered (licensed) because it is a "Historic Vehicle". 2 CJs and the Yamaha, as Tony takes a photo. Rear view of three bikes lined up as Roscoe arrives on his Kawasaki GTR with his son as pillion. Not a good photo: 3 bikes lined up. The four bikes and L to R: Dale (CJ), Roscoe's son, Tony (Yamaha), Roscoe (Kwaka). 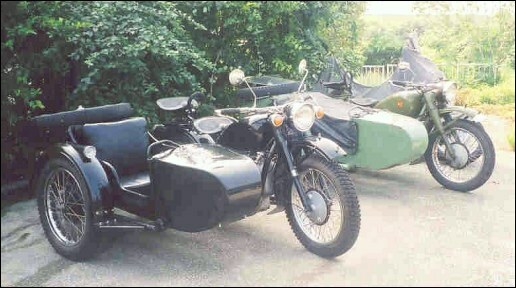 The fourth seat in the boot of Dale's sidecar. 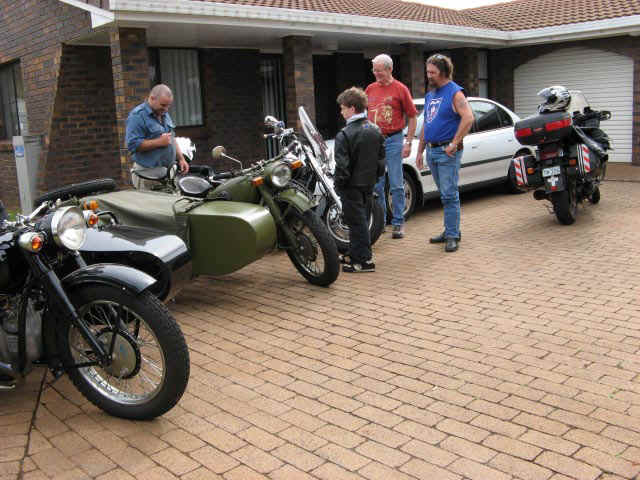 Driveway full of bikes with Tony, Roscoe and son, Dale. 2 CJs just before departure. After taking the photos, Dale rode his CJ back home and at 16:00 (4pm) the rest of us headed back down the range as far as Gatton. The other two riders were pleasantly surprised at how much more of the countryside they got to see while limited by the CJ to cruising at around 65 km/h. At Gatton, the other guys turned back towards Toowoomba while I continued on towards Brisbane. I arrived home at 19:00 (7pm) having covered the 140 km in exactly 3 hours. The CJ travelled without a hitch although I ended up with a badly sunburned face, this having been my longest ride in about twenty years. Altogether, a very enjoyable day's ride. This page was last updated on 07/02/08 at 08:12:51 Hong Kong Time.